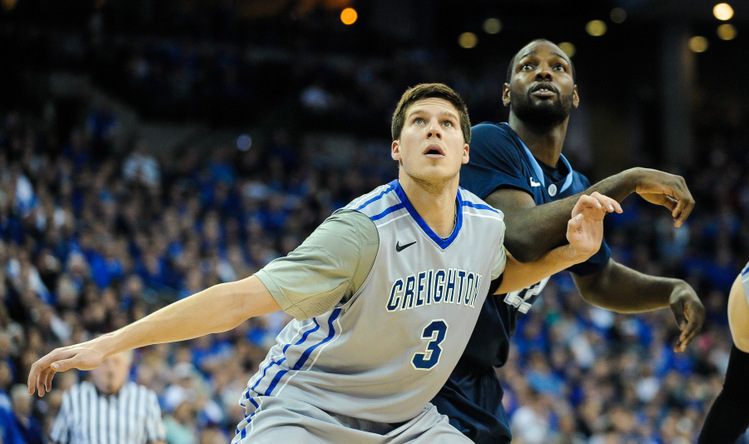 The much anticipated rematch between Villanova and Creighton became the Doug McDermott show. McDermott had the opening shots of the game with a pair of three pointers. Creighton raced out to the lead, and held it down throughout the whole half. Villanova didn’t back down, they kept it close and tight against Creighton. The Wildcats and the Bluejays traded blows, in the even half. If one team got a stop, the other did too, and when one team could score, the other would answer right back. It was a back and forth shooting contest until a James Bell foul was called that changed the tide of the game. The call was suspect, but regardless it was Creighton ball. It was the break that Creighton needed to give them some breathing room. It would spark an 11-0 run that helped the Bluejays get separation. The sold-out crowd was ecstatic for their home team. Creighton took a 50-37 lead into halftime. The second half ended the same way it did the first time these two teams met. The only difference is that Creighton would break a 100 points this time. Villanova did not have an answer for the Creighton offense. The Bluejays didn’t have the luxury of 21 made three pointers this time, but it didn’t matter. They shot for 64.2% overall on the floor, up from the 56.9% from the previous meeting. From three point range, they were 9 for 15. Creighton proved that they didn’t need to solely rely on the three pointer, they were driving the ball inside and making mid range jumpers. The Wildcats displayed a bit of resurgence midway through the second half, but by that point it was too late. James Bell fouled out at the mercy of another questionable call, except this time a flagrant foul when going up to block the shot. A Steven Ferrarini layup gave Creighton their 101st point and a Dylan Ennis three pointer provided the last points of the game. The final score was 101-80. I was taught to never blame the refs, but the officiating was questionable throughout the game. The number of off the ball fouls that were called was ridiculous. The stat sheet does not accurately depict the quality of officiating or the disparity between Creighton and Villanova. Creighton got away with moving picks and illegal screens. Referees couldn’t seem to identify flopping at all, and it hurt Villanova. Creighton players at times were flying 10 feet across the floor. The Fox Sports 1 broadcasters were able to acknowledge it and they even had a conversation on flopping for a few minutes. Granted, Villanova’s play wasn’t perfect, but the referees weren’t helping their cause either. The better team won today, the game should have been closer but it isn’t all to be put on the refs. The Wildcats defense just could not stop what Creighton was doing. The man to man defense just was not working at all, and the Bluejays were able to easily break it down with the use of screens. It was an even better shooting performance this time around for Creighton. An attempt at maybe switching to a zone defense could have helped, but we will never really know. Our guys played tough, but Creighton is a puzzle that we just can’t solve – yet. For Villanova, Bell was the leading scorer with 18 points. He also had 6 rebounds. JayVaughn Pinkston finished with 15 points, 5 rebounds, and 3 assists. Ennis provided 11 points off of the bench. Doug McDermott put on a show for NBA scouts. The senior star had 39 points and 7 rebounds. He was 13 for 17 on the floor. Isaiah Zierden had 13 points and 3 assists. Devin Brooks contributed 12 points. Grant Gibbs, who missed the first meeting due to injury, had 11 points and 3 assists. Villanova continues their road trip, this time at Providence. The game against the Friars will take place this Tuesday, February 18 at 7 p.m.